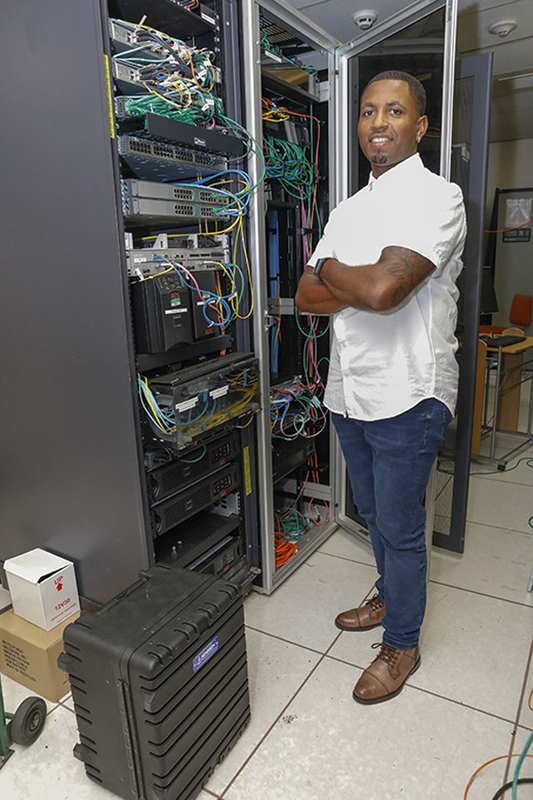 Operating the Government network, configuration, troubleshooting, managing over 150 users and 500 devices, and overseeing network maintenance are just some of the responsibilities Acting Chief Network Engineer Mr. Jacqui Simons is tasked with. Mr Simons technical work is one of many in the public service, which encompasses a wide range of varied fields and some of these areas are deemed hard to fill, meaning that there is a known limited talent pool with expertise in the specific area available on-Island. Minister for the Cabinet Office with Responsibility for Government Reform Lovitta Foggo said, “This Government aims to change the perception of careers in the Public Service. One such person is held by Mr. Jacqui Simons, who is a Network Engineer for Operations & Support. Currently he is Acting Chief Network Engineer in the Department of Information and Digital Technologies [IDT]. Mr. Simons entered Government through the Public Service Bursary Awards Scheme, a programme that has supported many young Bermudians’ educational pursuits with a view of preparing them to fill necessary technical and professional posts within the public service. As a former Bursary student, Mr. Simons gladly shared his journey within the IDT network team. The network team, manages the entire Government’s network infrastructure, or the data center, which is responsible for hosting the internet, overseeing the network’s shared drives and all applications [such as Microsoft Outlook] that allow the public service to perform their day-to-day work successfully. Mr. Simons, in his current acting role, manages a team of two within the Network Operations section, enthusiastically explains, “I’m a huge advocate for young Bermudians using all available opportunities for continuing their education, whether locally or abroad. “I was raised in a single parent home with three other siblings, and my mother made it clear that I would have to combine various means of financial support to further my education after high school. Mr. Simons returned to Bermuda from university in 2009 and was offered a role as a Network Administrator. After demonstrating his skills, he was offered a position as a Technical Analyst within the Network section. His responsibilities included managing the ticketing cue, fixing devices, and making sure the members of the public service had a steady connection from their computers to the mainframe. In 2012 when the Network Engineer post became vacant, Mr. Simons was promoted to the position. In April 2018, Mr. Simons started as the Acting Chief Network Engineer, after having the permanent position as the Networking Engineer for Operations & Support since 2012. As the Acting Chief Network Engineer, the extended list of his responsibilities now include operating and fine-tuning the entire Government network, configuration, troubleshooting, upgrades, managing over 150 users and 500 devices, overseeing network maintenance for three international locations, and various other essential behind the scenes tasks that most public service members and members of the public may not be aware of. Mr. Simons continued, “My current role comes with a huge amount of responsibility, and I’ve been fortunate to have worked on both large internal projects, with the most senior members of Government, and on exciting external projects such as America’s Cup and the new Fintech initiative. “My biggest success to date was in February 2018, when I was responsible for directing one of the biggest upgrades of the Government network. We upgraded and transitioned the network, which is currently the largest enterprise network in Bermuda, to a new high-scale platform. Mr. Simons believes that the public service has offered him exposure to innovative technologies and projects he wouldn’t have had access to. And he doesn’t think he would have had this chance having worked the same amount of time elsewhere. CONGRATULATIONS TO MR. JACQUI SIMONS. HOPE HE BECOMES THE PERMANENT CHIEF NEWTORK ENGINEER. ALSO THAT HIS & OTHER YOUNG ONES EARLY LIFE EXPERIENCES ARE PUBLICIZED REGULARLY IN MEDIA. These Experiences I’m sure would be GREAT for the many other Younger & Older Ones here to get on a path to succeed at the positive activities they like to do. Bermuda Will Keep Winning! Great stuff Jacqui and hard work truly pays off and when you don’t make excuses! Job well done! Proud of you! Continue to excel in your role! Soon acting will become permanent! We are so extremely proud of you Jacqui! You are an amazing person and you work hard for your achievements. Very well deserved for the most honest, hardworking person I know! You continue to make your family proud and we love you! Now *that* is the best praise ever. Congrats to Mr Simons in his accomplishments and well done to his family for their undoubted support. We are very proud of you at the Western Stars Sports Club/Dandy Town and wish you much success in your new role. Big up yaself Qui. You the reason I got into computer networks. Give thanks for the motivation. Nuff respect. A product of CederBridge Academy! Well done Jacqui! A product of CedarBridge Academy! Well done Jacqui!